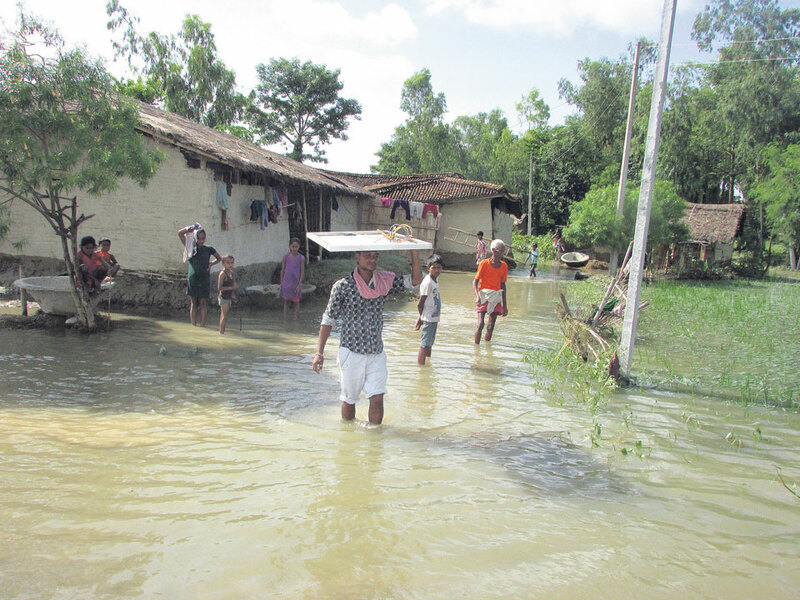 Residents of a flooded settlement in Mahottari district make their way through flood waters on Tuesday. MAHOTTARI, Aug 15: Mahottari district, which is presently struggling with floods, is now under threat of epidemic outbreak. Over 40,000 households in Mahottari district alone have been affected. Around 37 villages still remain inundated by flood water and people are beginning to panic with the possibility of an epidemic. The panic is triggered by the recent increase in cases of fever, cold and stomach related problems among flood victims. “We are surrounded by stale water and biological sediments accumulated by flood are beginning to rot. You can feel the stench getting stronger every passing day. We fear that this might soon breakout into an epidemic,” said Gajendra Gupta, a resident of Mahottari. “We are living in very unhygienic conditions and in such a situation communicable diseases like eye irritation, fever, diarrhea and dysentery, among others, can infect people and take the form of an epidemic,” he added. People were forced to flee their home following floods on Saturday and they have been not able to get back home. The government is yet to fully appraise the actual report on the number of families affected by it. Amid this, the victims are still deprived of relief. Gupta said that there is hardly any dry place for the displaced to take shelter. Coupled with that, in lack of rest and food, flood victims have begun to feel ill.
“Our health is deteriorating. We don’t have sufficient food, or bed or blankets. In such a situation, it children and elderly people will not be able to endure for long,” he noted. Jaleshwor, Ramgopalpur, Meghnath Gorhanna, Matihani, Balawa, Lohorpati, Samsi, Shripur, Bhangaha, Hariharpur, Hariharmani and Bathanaha, among other villages of Mahottari have been worst affected by the floods. Market places in rural and central part of those villages have been in chaos. Apart from food and shelter woes, the displaced flood victims have been facing acute shortage of drinking water. This, the victims feel, will eventually take serious toll on their health. “In time of crisis like this, first thing a state would do is to address issues related to people’s health. However, even after so many days, we haven’t seen any health workers around. We haven’t been provided with first aid or basic medicine,” Gupta said. Many of the flood victims have been living near roadsides under open sky. They complained that they are already experiencing several health issues. However, in lack of transportation facilities, they are not able to visit hospitals. 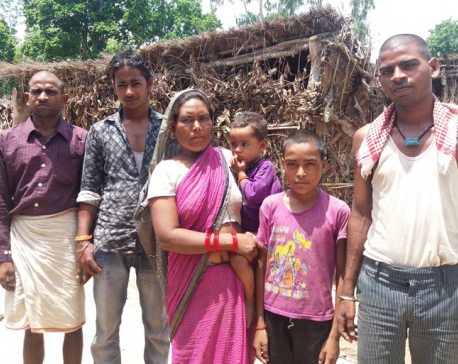 Mukesh Kumar Yadav of Jaleshwor-7, one of the flood victims, stated that his pregnant wife was rushed to hospital with help of some kin on Monday. “Thank god, I had some helpful kin around who helped carry my wife to hospital. Or else, what would I do?” he wondered. After his wife started feeling labor pain, he tried to find a vehicle to take her to doctor. But vehicle owners told him that they cannot drive her wife to hospital as all the roads are fully damaged. Yadav then resorted to his relatives for carrying his wife to hospital. “Even ambulance could not be managed. In that condition, there was little hope of saving her. However, relatives helped us on time and save her by carrying her to a hospital in Jaleshwor,” Yadav narrated. People are not only deprived of doctors but also medicines. According to Gupta, even though health posts have also been flooded and closed for now, availability of medicine is actually a regular problem. “We hardly get medicine from the health centers even in normal times. During such calamity, getting medicine from health post is simply out of question. Even if we visit the hospital after life gets back to normal, we don’t expect to get medicines from the health posts,” he said. He added that many people are likely to meet untimely death just in lack of essential drugs. District Hospital of Jaleshwor defended the lack of medicine stating that the drug store where it had stored medicine has been fully flooded and stored medicine has been rendered useless. Concerned officials assume that over 70 percent land of the district has been affected by flood though detail report is yet to come. Locals lamented that the government has been too slow in its response to the situation. “Roads are fully damaged. Flood victims remain isolated. They are hungry and naked,” remarked Ram Mahato of Jaleshwor-4. “The government is still thinking on ways to respond. By the time the government figures out what it needs to do and starts acting, many people will be already dead,” he added.